I'm trying to configure my Rpi so that it first tries to get IP configuration data from a DHCP server and falls back to a static configuration if there is no server. From what I can see, dhcpcd seems to be just looking for a DHCP server without falling back to the static configuration. Can anyone tell me what I am doing wrong? I also notice that the wiki page doesn't specify a parameter for subnet masks (mine has to be 255.255.254.0). Do I just add a line saying static subnet_mask=255.255.254.0 to the profile? Help will be greatly appreciated. Don't you need to be going through netctl for this? I am not able to read your output on that other website, but take a look at the default profile in /etc/netctl and see if it might be interfering with what you are trying to do. Don't you need to be going through netctl for this? I don't mine using netctl if that is the correct way to do it but I have no idea how I can make netctl do what I want. dhcpcd is the only program I've seen so far that can do the static IP configuration fallback I want. ...take a look at the default profile in /etc/netctl and see if it might be interfering with what you are trying to do. I did manage to spot a profile there with the name eth0 (same as the interface I'm using) and the command netctl list seems to indicate that this profile and another one called ethernet are running but I didn't manage to stop them. I am visiting the forum in a text browser, without access to images. Copying and pasting output is more accessible to people using text browsers and screen readers. I do not know how to do what you want using netctl, but take a look at the profile in /etc/netctl and change the settings to match your requirements. If they are not the same as what you need at this point, that would explain things not working. There is information in the arch wiki about netctl. I eventually decided to cut my losses and just assign a static IP address to my Raspberry Pi. If I ever find a way of doing what I asked for, I might put the instructions in this thread. 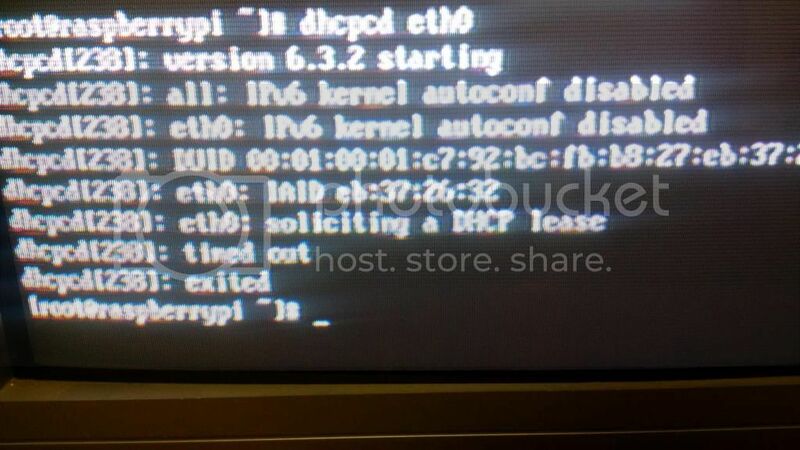 I also am trying to get my Raspberry Pi to fallback to a static IP configuration if DHCP fails. as suggested on the page "Fallback static profile"
running "ifconfig" does not have a "inet addr:" line in the "eth0" section. running "ifconfig" shows a "inet addr:" with an IP address the same as what I set in the "/etc/dhcpcd.conf" file. running "ifconfig" shows a "inet addr:" line in the "eth0" section with a different IP address (assigned by the DHCP server). I haven't had the chance to do much testing yet, but it *seems* be working for me with Raspbian.